We at styledynamix can build a custom stainless steel exhaust system for 99% of vehicles on the road today .We have a complete range of products and solutions when offering you any of our custom stainless steel exhaust systems. All of our exhaust systems, exhaust boxes, pipework and tailpipes are made from 304 grade stainless steel, and are fully TIG welded for the ultimate look and quality. We also offer a full range of Catalytic converters from standard OE replacement catalytic converters, to high flow sports cats for increased power gains. Thought fitting a custom stainless steel exhaust system was expensive ? then think again ! As we have so many vehicle applications, we have learned that a very high percentage of stainless steel exhaust that are fitted to customer vehicles, have been the same if not cheaper then the standard OE replacement exhaust system. That coupled with the fact that we have offer a very quick turnaround, means you can have what you want ! For everyone who enters the world of car tuning and styling, there is no better way to start than to get an affordable youngtimer and work on it. These cars are perfect in so many ways. First of all, you can count on low purchase feet. Also, these cars aren’t too much complicated to work on them. It is pretty much all about mechanics, no need for headaches caused by complicated electronics, usual for modern cars. On the other side, these models are pretty much on par with modern cars in terms of mechanics, so you can enjoy the quality ride and, more importantly, get tons of aftermarket parts. If you live in Germany, or any other European country, the Golf Mk2 is probably the first car that will come to your mind. This is definitely one of the most successful and most appreciated generations of the legendary, European’s best-selling compact car. It offers an amazing quality, as well as a classic design, suitable for all kinds of modifications. A wide palette of engines gives a lot of possibilities, while a relatively simple design allows you to work on it no matter how modest your knowledge about mechanics is. For a vehicle that has been produced 25-30 years ago, one of the most critical parts, from today’s perspective, is a suspension. With good components, you can significantly improve your ride. Of course, visual aspect plays an important role as well. 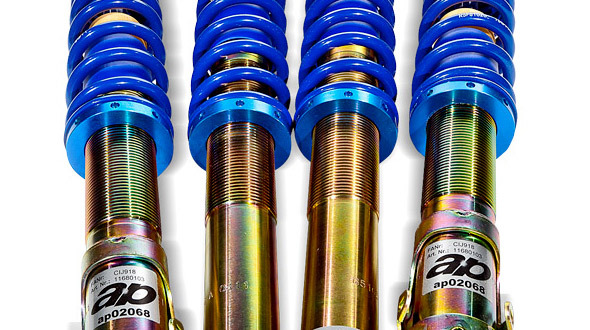 Considering probable cheap purchase, you definitely don’t want to spend lots of money on suspension. This is definitely the area where AP products perform best. Considering that we are talking about one extremely popular car, AP engineers designed a while program for Golf Mk2. Of course, the cheapest product of this line is the set of springs. Designed especially for the legendary compact car, they can lower your vehicle for about 60 mm. More direct driving and overall fun are the things you can definitely count on. Another great solution would be AP Sports Suspension. A kit that includes both springs and dumpers offers you a possibility to set up your ride in any way you want, balancing between performances and comfort. Finally, the best and also most expensive variant would be AP Coilover Kit for WV Golf Mk2. Adjustable suspension with lowering of up to 70 mm offers a lot of possibilities. Lower centre of gravity, better cornering, more agility, better acceleration, and braking are some of the key benefits. It is by far the best way to get better performances while keeping a high level of comfort.